A LoyaltyLobby reader forwarded me an offer that he had received from Accor (you can always forward emails that you receive from programs to me). Le Club Accorhotels seems to be targeting accounts that haven’t had any activity for a while that will soon have the points expire. Note that you need to have a stay within 3 months of signing up for this offer to be eligible for the double points. The Accor accepted my registration. And sent also an email to confirm it. It is interesting that the terms and conditions indicate that this would be a targeted offer, but then lets you register and confirms the registration also by email. You should be able to combine this with the recent quintuple points offer that I wrote about couple of days ago (read more here). 1. 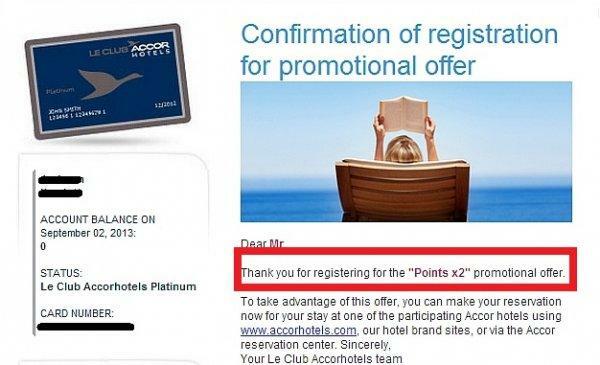 The general terms and conditions of the Le Club Accorhotels program apply to the “Points X2” offer. 2. This offer enables members of the Le Club Accorhotels Loyalty program to benefit from bonus Le Club Accorhotels points, regardless of their status, on the condition that they were sent the dedicated e-mail, that they sign up for the offer by clicking on the “Sign me up for the offer” button, and that they fill in and confirm the requested information. 3. The bonus points offer is valid for any booking and corresponding stay at one of the 2,700 hotels participating in the Le Club Accorhotels program, within the 3 months preceding the points expiration date provided in the e-mail sent presenting the offer. 5. To benefit from this offer, the member must book ahead of time on-line (via accorhotels.com or one of our hotel brand web sites) or via our Accor reservation center. 6. Terms of sale apply for specific reserved public rates at each hotel. Prepayment for the entire stay by credit card may be requested. Some bookings (at rates that are subject to conditions) may not be modified or canceled. 7. The member must present his/her loyalty card or member number at the hotel reception desk upon check-in for the stay in question. 8. A booking for several rooms covered by the same member during his/her stay is only counted as one stay. 9. This offer may not be combined with any other offer and does not apply to groups. 10. Points are credited within ten (10) days following the member’s check-out from the hotel.